When you think about the most romantic mode of transportation, what comes to mind? Cars take concentration. Bus rides are too busy. Cruises only deliver you to ports reachable by water. Trains, though, are a terrific way for couples to travel. Seated side by side, you get to view magnificent scenery through your window. There's time to kiss. Sleep. Dream. Whether you board a scenic train, an overnight train, or even scenic commuter trains, you're likely to find such rides great fun for two. 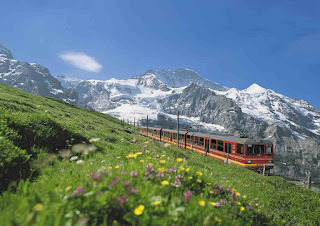 Swiss train stations, staffed by multi-lingual personnel, function as service centers complete with currency exchanges, luggage-storage facilities, and bicycle rentals.